Snowplows sit off to the side of Interstate 70, just west of the Eisenhower Tunnel before Silverthorne, on Saturday as winter weather settles into the area. According to an NWS forecaster, Summit County could receive 3-6 inches by Sunday morning with the storm lingering through Tuesday. Snow falls Saturday morning at Loveland Ski Area, just west of the Eisenhower Tunnel. 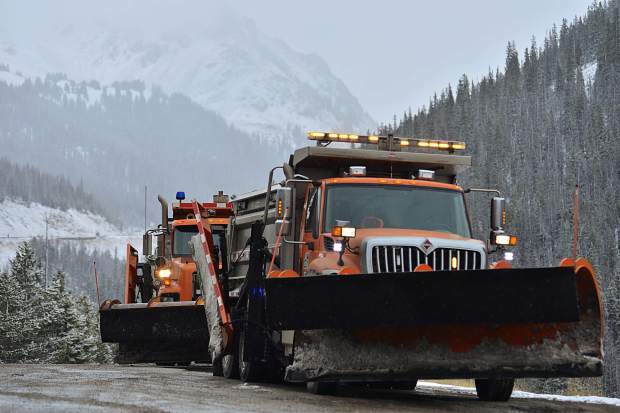 A customer-service representative estimated they had received as much as 3 inches of fresh snow by 2:30 p.m.
A snowplow carves its way down U.S. 6 after crossing the Loveland Pass on Saturday. 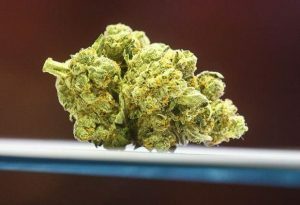 The Colorado Department of Transportation put into effect and later lifted traction-law requirements along the route. Those restrictions could be reinstated if conditions worsen. 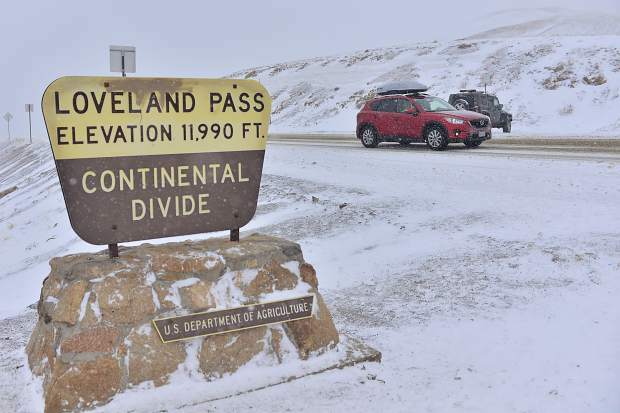 The Colorado Department of Transportation put into effect and later lifted traction-law requirements along U.S. 6 at the Loveland Pass after a snowstorm moved into the Rocky Mountains on Saturday. According to CDOT, those restrictions could be reinstated if conditions worsen. Snowplows get ready to head out Saturday morning at the Colorado Department of Transportation maintenance facility in Silverthorne with a winter storm moving across Coloradoâs northern and central Rocky Mountains. 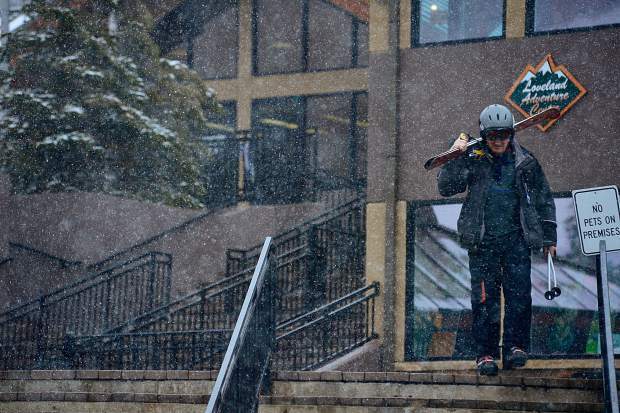 A wintry mix came over the High Country on Saturday as interstate drivers spun out, nearby ski resorts welcomed the gift and forecasters predicted Summit County could wake up to a few inches of snow Sunday morning. The developing storm prompted The National Weather Service to issue a winter weather advisory for the Gore and Elk mountain ranges, running from 6 p.m. Saturday until 11 a.m. Monday. The northern Rocky Mountains along the Colorado-Wyoming border were expected to see the heaviest accumulations Saturday, with snow continuing to pile up throughout Saturday and Sunday until letting up sometime Monday. Accumulations of 8 to 16 inches are possible with localized totals up to 24 inches, according to the NWS. 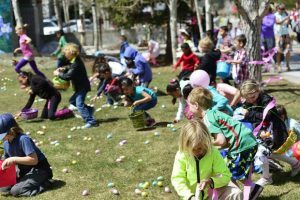 For Summit County, NWS forecaster Kyle Fredin said the area could see 1 to 2 inches of snow by late Saturday evening and 3 to 6 inches overnight. The highest elevations will likely experience the most significant snowfall, he added, with lower totals in the valleys. “What you’re going to have is an unsettled pattern persisting into Tuesday,” Fredin said of the winter storm, adding that it will likely continue producing precipitation into early next week before temperatures return into the high-40s. “In other words, we don’t expect it to warm up and dry out until Wednesday,” the forecaster said. 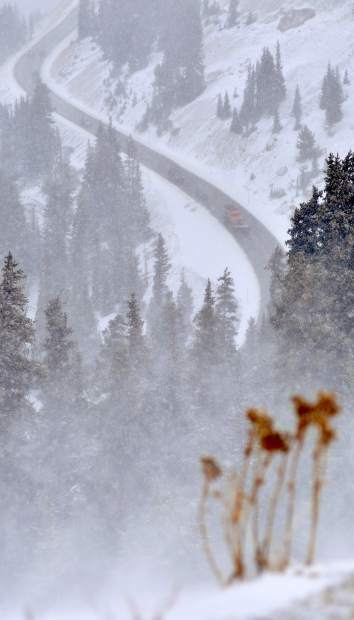 Saturdy afternoon and early evening were largly quiet after multiple spin-outs on Interstate 70 led the Colorado Department of Transportation to close westbound lanes Saturday morning near the Eisenhower Tunnel. The interstate reopened a couple of hours later, and a traction law put into effect between Silverthorne and Bakerville on I-70 was lifted before noon. The same happened with U.S. 6 at Loveland Pass. However, CDOT issued traction-law restrictions early Saturday before lifting those restrictions, reissuing them and then lifting them again. The department’s 511 traffic line stated those restrictions could be reinstated if conditions worsen. CDOT also issued an advisory announcing avalance control measures would be taken along Loveland Pass at daybreak Sunday. For the most part, roads in Summit County remained dry throughout daylight hours on Saturday with preceptition sticking just east of the tunnel but not so much to the west. 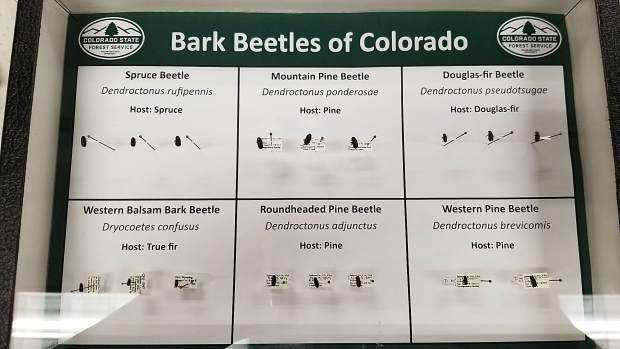 At the same time, skiers and snowboarders at Loveland Ski Area didn’t seem to mind, and a customer-service agent who answered the phone there said she believed they had received about 3 inches by 2:30 p.m. Saturday. Down the road, a worker at Arapahoe Basin Ski Area reported about 1 to 2 inches of new snow by early Saturday afternoon. So far, Loveland and A-Basin are the only two ski areas operating in the area. 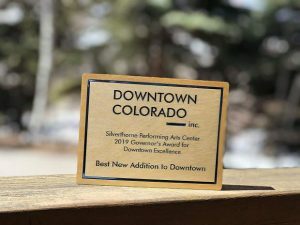 Breckenridge, Keystone and Copper resorts are slated to join them Nov. 10. As of 6 p.m. on Saturday there was no snow accumulation in the low-lying areas of the county. For up-to-date information about the developing storm, go to SummitDaily.com.